Lately I’ve been seeing a lot of paint dipped bud vases on Pinterest. 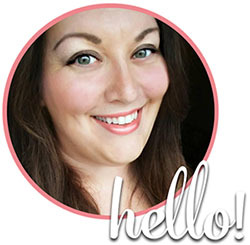 The trend is increasingly popular but the good news is that these are so simple to make and they really create a statement when you have a few of them together. 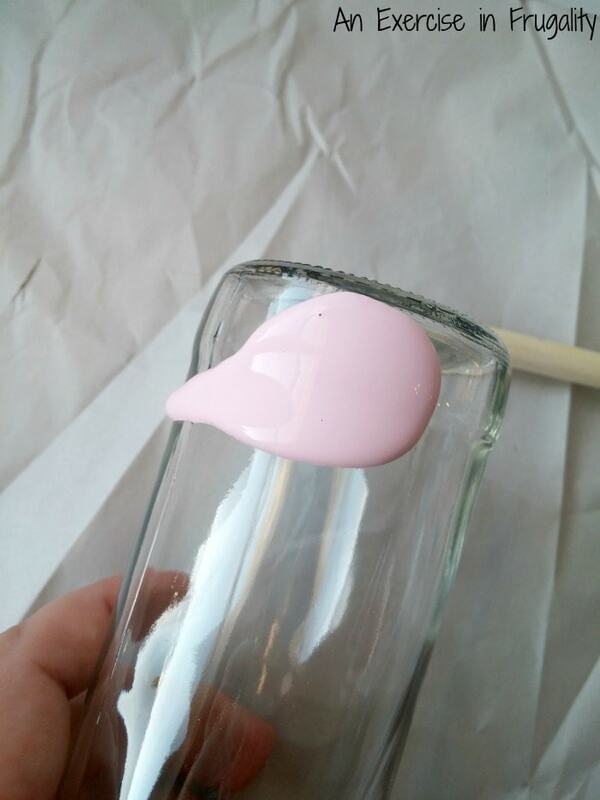 There’s lots of different ways you can go about making paint dipped bud vases. The best part about it is that you can use any kind of jars or bottles you have laying around. Glass soda bottles, mason jars and Starbucks Frappucino bottles work well (rinsed thoroughly of course). 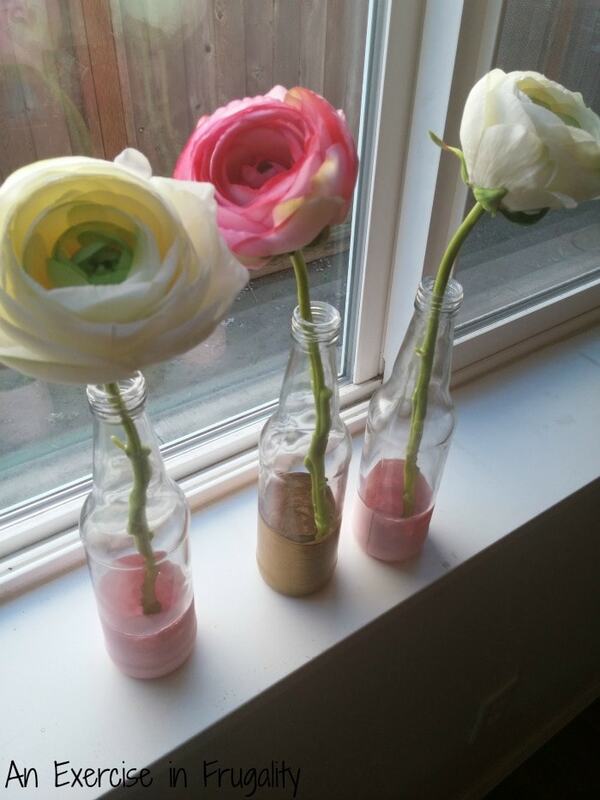 You could even do larger wine bottles or vintage milk bottles too. I didn’t have any glass jars or bottles I was willing to part with, so I picked up three glass soda bottles at Michael’s on sale for $0.99 each. All you need to do is wash your bottles and dry well. 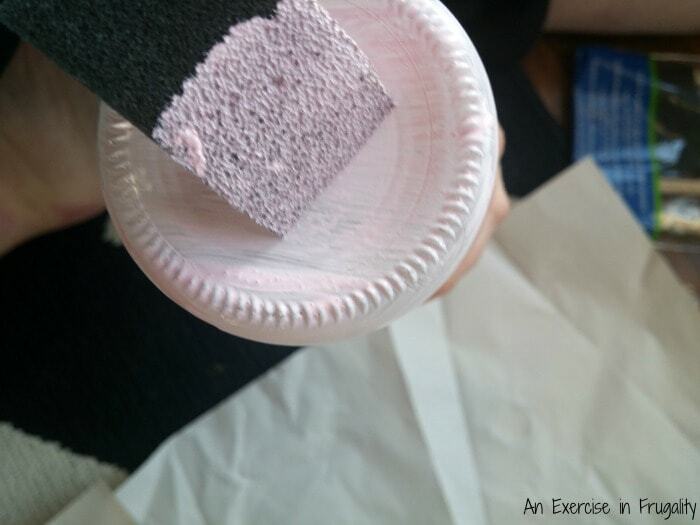 Then give them a quick wipe down with rubbing alcohol to remove any fingerprints or residue. Then choose your paints. Since I am using these for decorative, fake flowers, I won’t worry about the paint being water-safe. I used regular craft paint, but you can also use gold leafing for a different look. Simply daub on several coats of the paint, allowing each layer to dry completely before painting the next layer. For a simple, “dipped” look, I didn’t bother to tape off the edges because I wanted them to look soft and random. If you like a cleaner line, or an angled look, you can use painters tape to mark off your paint line. Once they are dry, you’re ready to go. 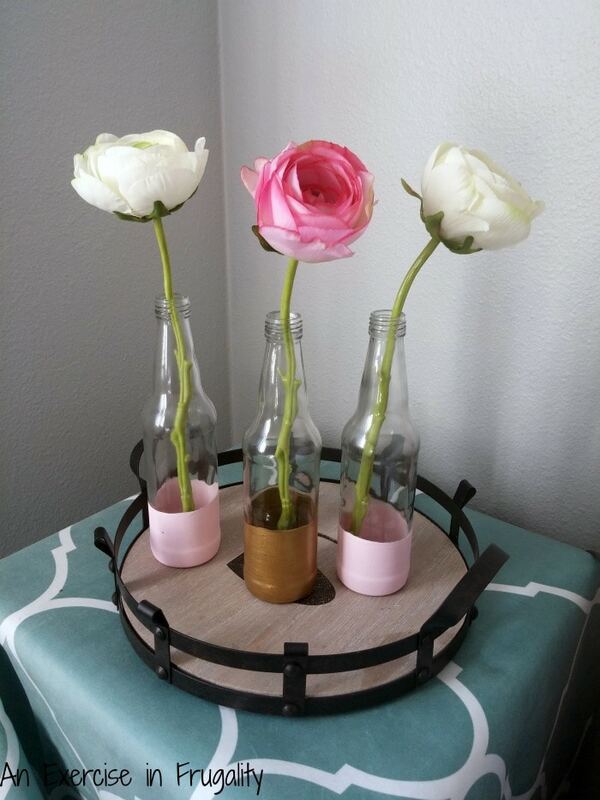 Simply insert a bloom of your choice and display your finished vases. 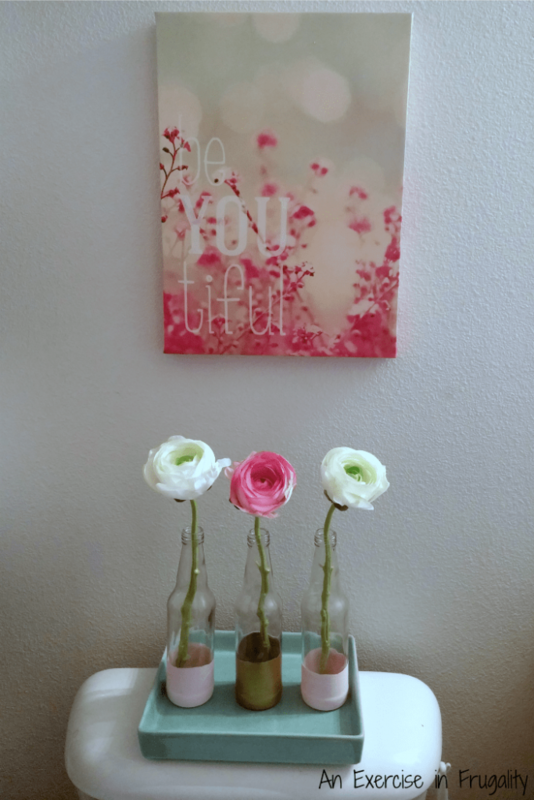 I think these Paint Dipped Bud Vases are really cute, and very simple to make. 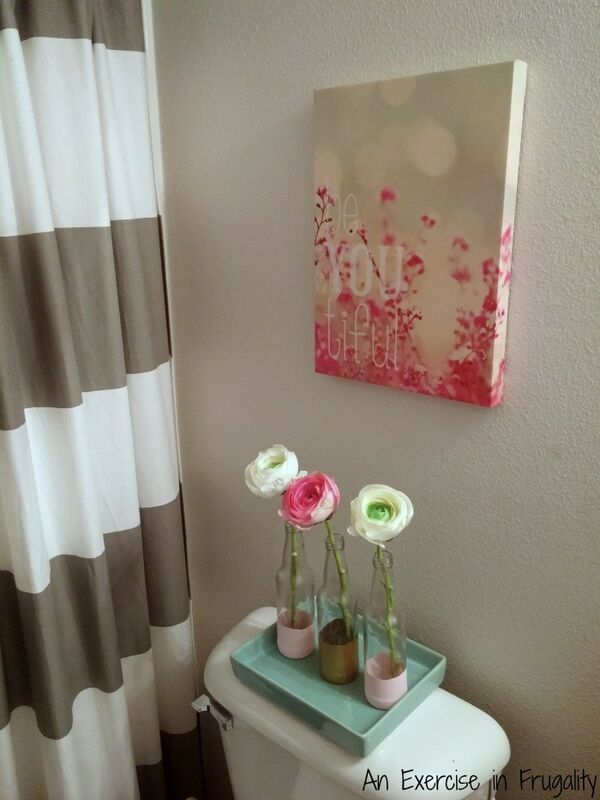 This whole craft cost under $10 for all 3 vases including the flowers, which were on clearance at Michael’s for 40% off! These make an adorable Easter centerpiece, and they would also look stunning as part of a rustic wedding tablescape! I have been feeling the winter blahs lately, and I needed a little dose of pink and flowers to cheer me up, and these totally did the trick! 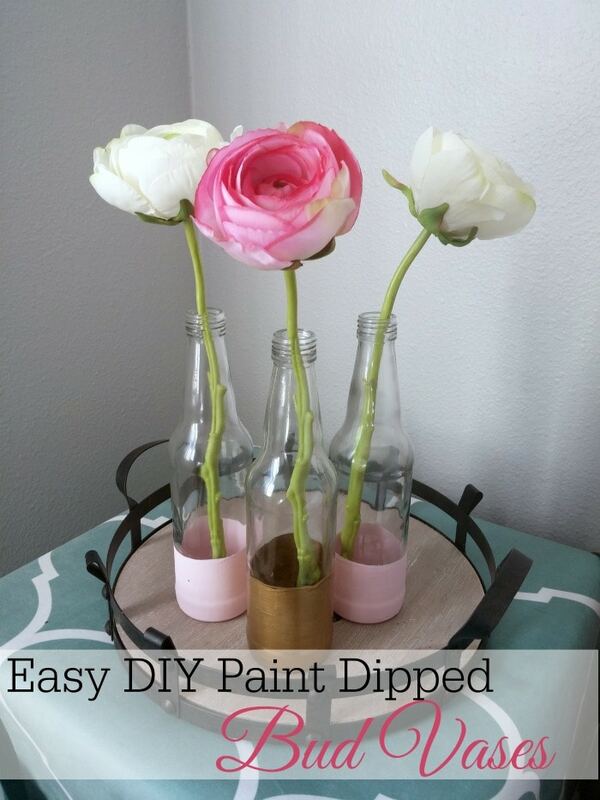 What do you think of these DIY Paint Dipped Bud Vases? These are so cute! I just threw out like a dozen wine bottles (no clue what the heck I wanted to do with them) but I’ve got a nice stash growing now. I’ll have to try this one out!